Zubia, a redshirt freshman, is one of five former high school quarterbacks on the Texas baseball roster. Zubia has been on a real tear, accounting for half of UT's home runs and 23 percent of its total RBIs. Zubia actually has committed to UT coach David Pierce twice, originally signing with Tulane and then transferring to UT when Pierce was hired. It’s baseball season, but a debate can always be had in Texas’ dugout about which Longhorn was the best high school quarterback. Kamron Fields, a freshman from Garland Lakeview Centennial, chose Texas baseball over football scholarship offers from Iowa, Minnesota and Utah. Sophomore infielder David Hamilton once rushed for 2,000 yards as San Marcos’ dual-threat quarterback. Michael McCann (Round Rock Cedar Ridge) and Chase Shugart (Bridge City) also were high school quarterbacks. Zach Zubia owns a couple of passing records at Houston’s Strake Jesuit. The former quarterbacks still occasionally throw the football around at UFCU Disch-Falk Field. Their old Hudl highlights have been played on the clubhouse TVs. Zubia, a redshirt freshman, has anointed himself and Fields as the baseball team’s top prep quarterbacks, though he concedes Hamilton is a “dark horse.” A vote among the Longhorns, however, was won by Fields. “He had football offers. What do you expect?,” Zubia conceded. But that vote was about gridiron glory. This spring, Zubia is competing for baseball playing time. With outfielder Austin Todd nursing a thumb injury, Zubia has hit cleanup in UT’s past two games heading into this weekend’s home series with Northwestern. He’s batting .300 and collected all of his team-leading eight RBIs during a four-game stretch last week. The 6-4, 240-pound masher hit his first two career home runs in a 10-5 loss at LSU last Saturday. Hitting with power is nothing new. Zubia hit 22 home runs last summer in the Northwoods League, a 20-team college summer league based in the Midwest. So far, Zubia has been used either as a pinch-hitter or a designated hitter. He eventually could figure into Texas’ plans to succeed Kacy Clemens at first base. 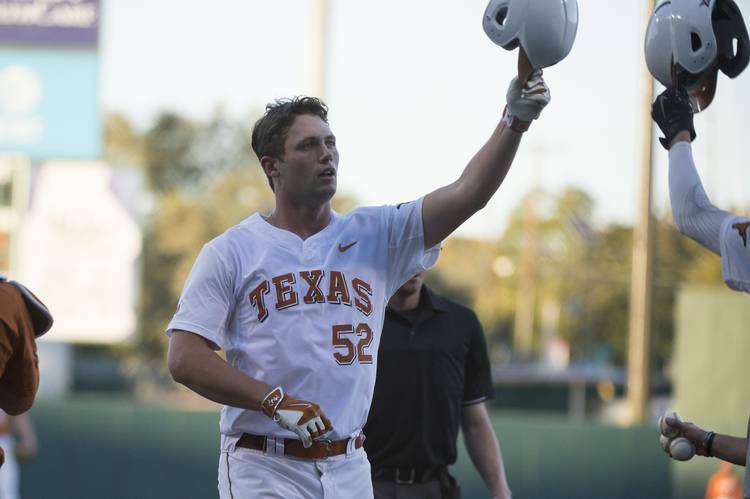 There’s an opening on the right side of the UT infield since Ryan Reynolds, who was expected to be the starter at first base, has been labeled by Pierce as “our best third baseman.” DJ Petrinsky, who started at catcher in the season opener, has logged six games at first. Pierce recently opined that defensively, Zubia is “better than I give him credit.” The second-year coach said Zubia needs to improve his footwork at the position. Zubia originally signed with Tulane, which was where Pierce was coaching at the time. Following Pierce’s hire at Texas, Zubia transferred and sat out last year. When asked about committing to Pierce twice, Zubia said trust was a large factor. Thus far, Zubia has accounted for half of UT’s home runs and 23 percent of the team’s 35 RBIs. Texas has scored 38 runs, which ranks 139th nationally and sixth in the Big 12. The Longhorns did put up 11 runs in its only win at LSU. The offense in that 11-1 victory supported sophomore Blair Henley, who earned the Big 12’s pitcher of the week award on Monday.